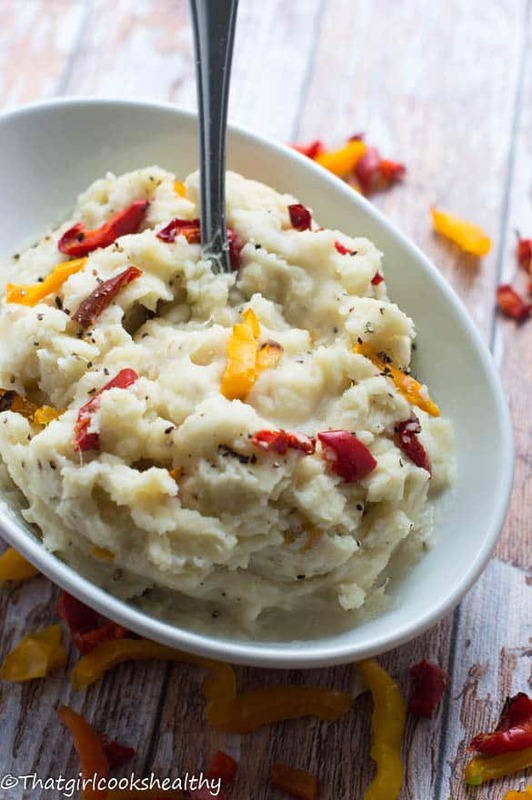 Mashed yam recipe – tired of boring mashed potatoes? 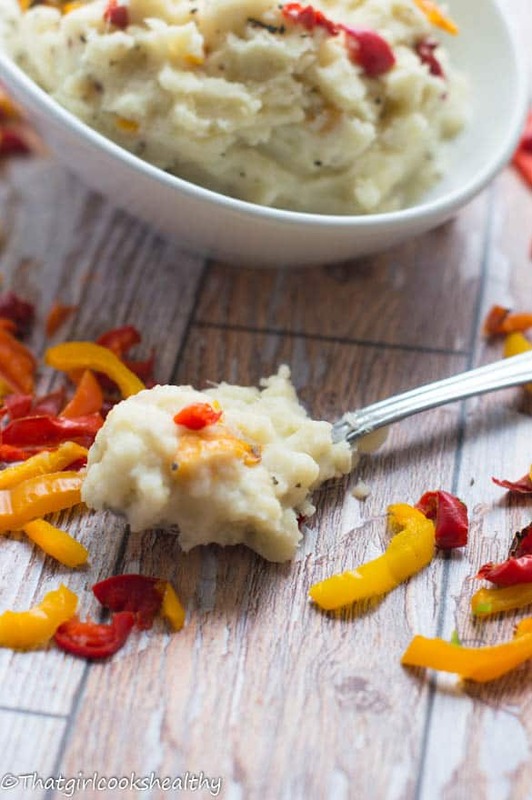 Well try this mash made from boiled yam that’s mashed into a creamy consistency with roast garlic. 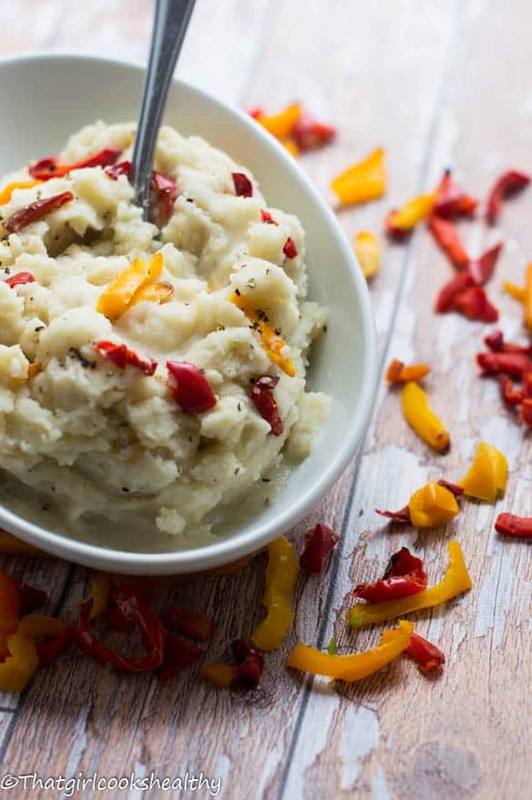 Mashed yam? Now this recipe requires a thorough breakdown especially for my stateside readers because “yam” as I know it is different from how they refer to it in the states. Whenever I post a recipe I’m always mindful of being as clear and concise about food terminology and cultural differences. In case you haven’t noticed already, when discussing a tropical fruit or vegetable that’s known by several different names I make it my duty to feature the alternative names in my post in order to reach a wider audience. An example of that is cho cho which is known as chayote or christophine, by factoring the additional names this becomes a great way to include others cultures who in this instance know cho cho by the name chayote. However with yam that’s not quite the case and I have a short but sweet story was completely opened my eyes to transcultural barriers. Yam in the English speaking parts of the Caribbean is a ground provision, ground provision in short are those edible tuber root vegetables, so whenever you hear an islander refer to tubers as this just know they’re speaking about yam, cassava, dasheen (taro) and so fourth. Yam is one of many crops that was introduced to the Caribbean via the transatlantic slave trade from west Africa and it’s also widely cultivated in Asia. In certain parts of the united states and Canada they make reference to several varieties of sweet potato as “yams” the truth be told is that true yam as I know it and “sweet potato yams” do not belong to the same family. The Caribbean yam (albeit not exclusive to the Caribbean) contains a lot more starch and is drier than “sweet potato yams” and isn’t as sweet, if anything it can be quite bitter. There’s also another type of yam known as “yellow yam” I have a preference of this one as it has an element of sweetness to it. When I visited the states a while ago I went to the southern region and asked for some “yam” as I was happy to see it on the menu. The waitress proceeded to serve me a plate of “sweet potatoes”. Nevertheless to say I was dumbfounded and couldn’t understand how and why she messed up a simple order. Being confident in my observation I explained that there was a discrepancy with my order, but neither of us could understand what the issue to hand was. In hindsight it’s actually very funny, yet it raised awareness as to why she look so confused and why I second guessed at the time because of a minor transcultural barrier. 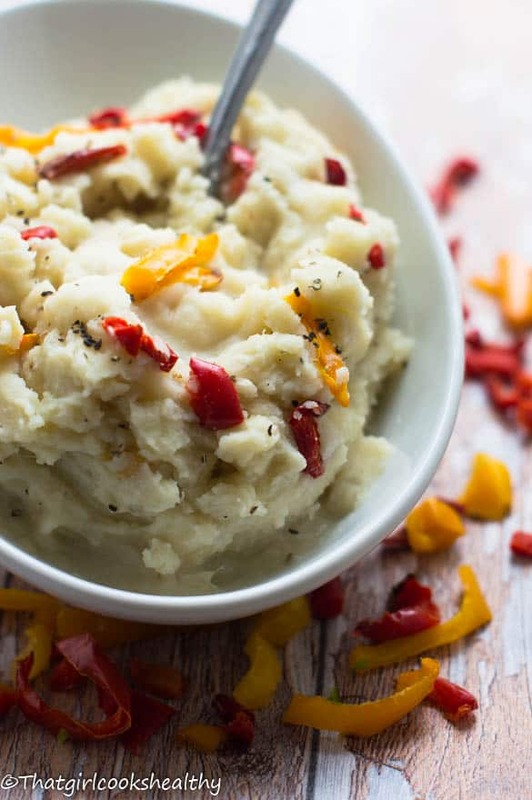 This mashed yam recipe is a great alternative to white potatoes which are known to raise the blood pressure and not on the paleo list. If you can obtain some, treasure it with dear life, it freezes well so chop it up and keep some to hand. I eliminated that dryness and creamed the mashed yam with coconut milk and true favourite of mine. The true kick in the mashed yam are the roasted garlic cloves, not so pleasant if you want to kiss your significant other or socialise, just have the mints on the ready afterwards (it’s not that pungent). I find roasting the cloves really deeps the flavours and mixed into the mash is highly delectable. Peel the yam first of all, the skin thankfully isn’t as tough as cassava, it comes off with ease. You don’t need to cut the yam into mirco pieces large chunks are fine. I totally forgot to mention the roasted peppers, can we say heaven? YUP again roasted bell pepper and garlic really heightens this recipe. 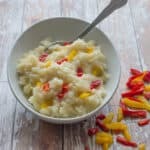 Have this alone as it’ quite filling courtesy of the coconut milk or as a side dish for a main meal. 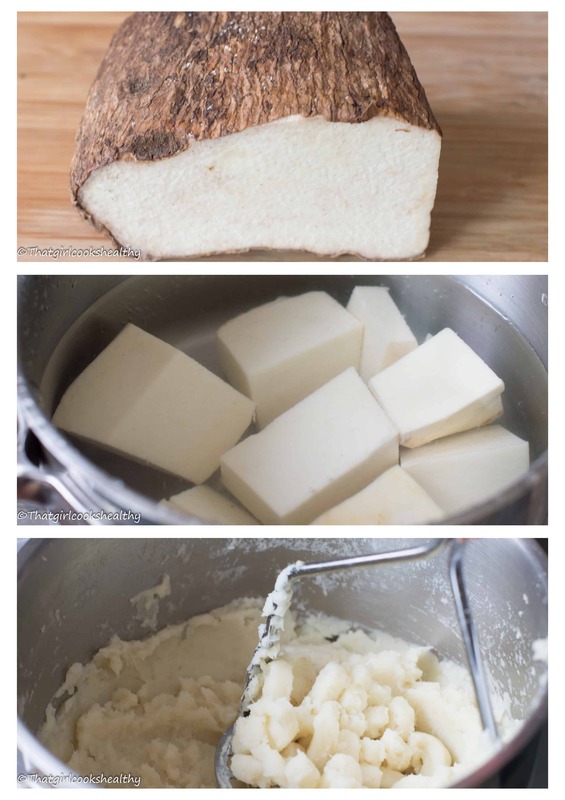 If you can get hold of yam, taro (dasheen), cassava would be a great substitute. Preheat the oven to gas mark 6/200 degrees celsius. Line a baking tray with parchment paper and place the garlic cloves and chopped bell peppers in the oven to roast for 20 minutes, then remove and set aside. While the garlic and peppers are roasting, place the chunks of yam in a large saucepan and boiled until tender, this should take 10-15 minutes. Drain the excess water from the yam and use a potato masher to mash until smooth. As you begin to breakdown the yam use the coconut milk to aid this process. Squeeze the garlic pulp from out of the partially charred skin and mash into the creamed yam with some black pepper to taste (1/4 tsp is suffice). Add the roasted pepper to the yam and garnish with the remainder. Thank you. You will enjoy it!